Waterless Dog Shampoos – Are They Safe? While we love our canine companions, the truth is that they don’t always smell great. Even when they just smell “doggy”, canine body odor can become a real problem even for dog lovers. Proper grooming and regular bathing will go a long way in curbing doggy odor and keeping our pups smelling sweet and clean, but finding the time to stick Fido in the bath can be challenging. 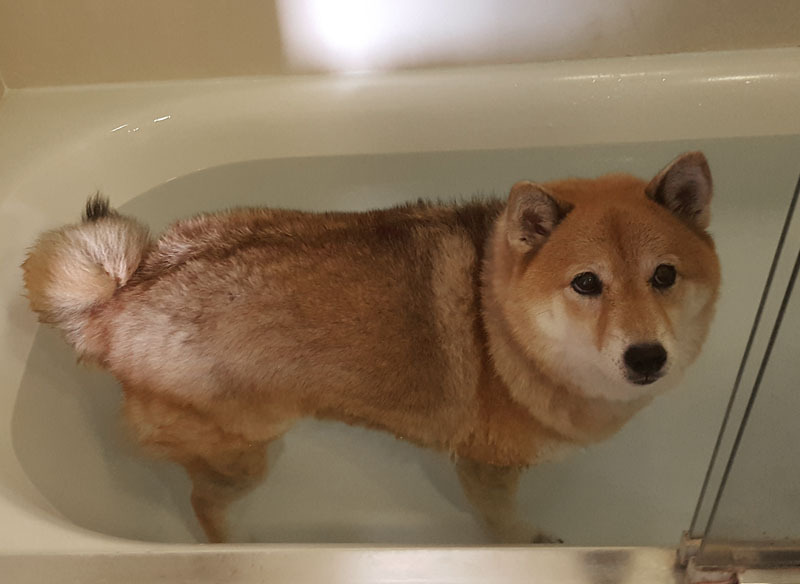 While most of us can take a shower in less than 10 minutes, bathing our dogs can be quite a bit more time consuming, particularly if they don’t especially enjoy it - which a lot of Shiba Inus don't. Large dogs often require the entire bathtub (if you’re lucky enough to have one) and smaller dogs take up the whole sink. Then there are the towels, the inevitable shaking, and the wet doggy smell that permeates your house for hours afterwards. 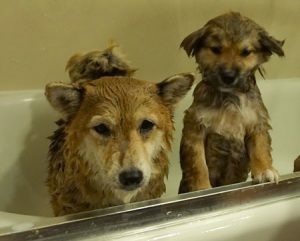 The pet industry has responded to this common problem by introducing a relatively new product to the market: waterless dog shampoos - also referred to as "dry shampoos". While the jury is still out on the safety of individual brands of waterless dog shampoo, we’ve done a bit of research and the truth is that, by using waterless dog shampoos, we may unwittingly sacrificing our dog’s heath and well-being for the sake of convenience. There are a few things to watch out for when considering whether or not to use waterless shampoo on your dog, and there are also safer and more natural alternatives. What Exactly Is Waterless Dog Shampoo And How Does It Work? Waterless dog shampoo is the equivalent of a human powder bath. Anybody old enough to remember "Mini Poo" dry shampoo? In other words, it’s not shampoo at all! Just like human beings, a dog’s skin is covered in sebaceous glands, which produce oils to keep their skin supple and their coat shiny and moisturized. When these oils come into contact with oxygen and build up on the dogs coat, they create that typical “doggy smell” that we all recognize. Dry shampoos are made of oil absorbing properties, such as powders and clays, which absorb the excess oil on your dog’s coat. While human beings usually wash their hair multiple times a week, the same cannot be said for dogs. In fact, it is precisely because we wash our hair relatively often that dry shampoos can generally safely be used on human hair. But since dogs only get bathed once or twice a month, using dry shampoo on their coats will simply cause the product to accumulate along with the oil, dead skin cells, and debris. Definitely not the "clean" we are going after in the first place. Washing your dog with a an organic shampoo and water is the only way to truly clean their fur and skin. Dry doggy shampoo may make them feel less greasy and smell better, but it’s really just a stopgap measure and isn’t actually “cleaning” your pup! Waterless Dog Shampoo- Is It Worth The Risk? While waterless dog shampoo may seem like a convenient way to prolong the inevitable bath for your dog, there are some aspects to this product that should make you think twice. 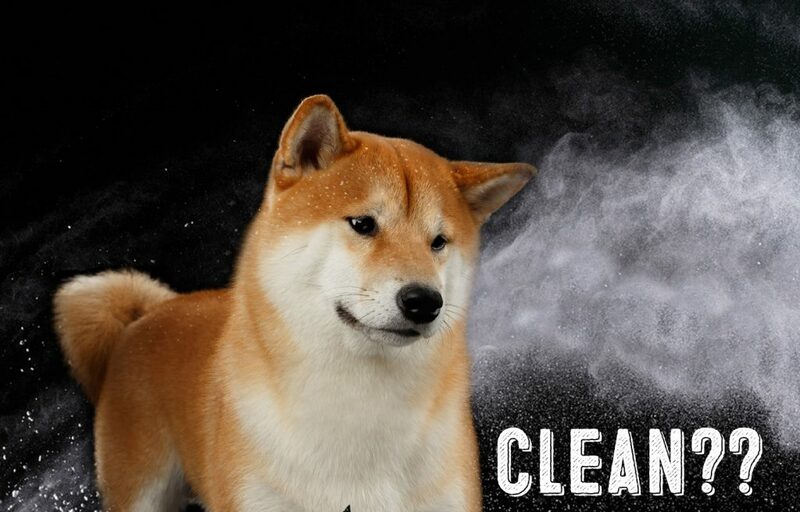 First of all, waterless dog shampoos aren’t truly cleaning your dog’s fur and skin. This is an important point to make, and the same goes for human-grade dry shampoo. While your dog may "seem cleaner", you’re really just using oil-absorbing chemicals to absorb excess oil and fragrances to make them smell nice. Secondly, many waterless dog shampoos come in aerosol form, which can be dangerous to dogs that are susceptible to breathing issues such as Pugs and Bulldogs. It’s best to avoid using aerosol products on your dog. Remember, they can’t simply reach for a tissue if the smell bothers them! 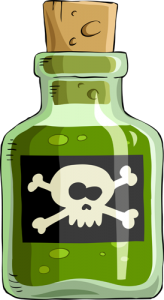 DMDM Hydantoin (actually a form of slow releasing formaldehyde that has been linked to cancer). While waterless dog shampoo may seem like a great time saver, the truth is that we don’t recommend them. 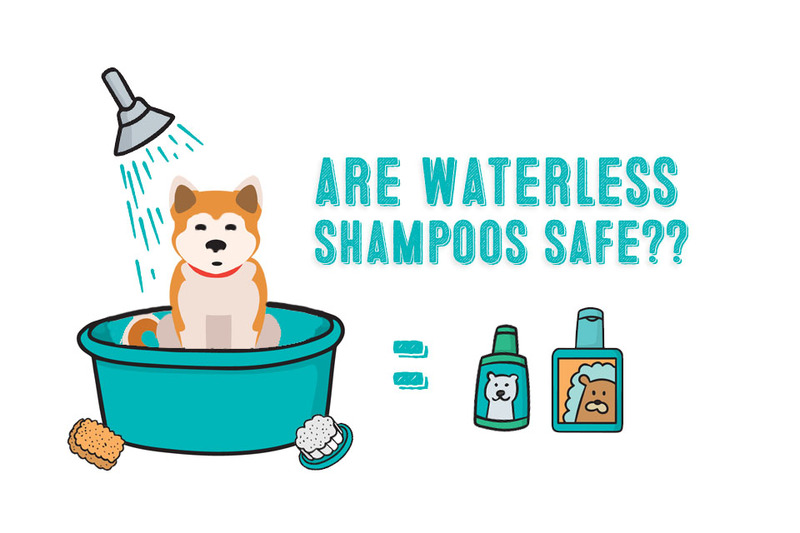 Not only do the vast majority of waterless dog shampoos contain chemicals that may be harmful to your dog’s health, they also don’t actually “clean” your dog’s fur and skin. While no one likes a smelly pooch, regular bathing with an organic shampoo specially made for dogs is your best bet when it comes to combating doggy odor. We recommend organic dog shampoo over the often cheaper and more readily available alternatives because products that label themselves “organic” must follow very strict guidelines in order to do so. If your dog is getting a little funky and you don’t want to deal with giving them a bath, there are a few safer ways to get through the interim period. One great option is to simply use a gentle baby wipe to wipe your dog down. While you should avoid baby wipes that are heavily scented, this is a simple and inexpensive way to freshen up your dog’s fur in between baths. However, if your dog is a "licker" and likes to lick his fur, it's probably best not to use baby wipes. Certain brands of baby wipes have ingredients that aren't meant to be licked or ingested. Instead, you can simply also use a damp towel to rub them down a bit and then dry them off. Sometimes just a little bit of water and a small dash of organic dog shampoo can work wonders! 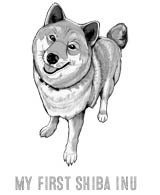 If your dog has extremely oily fur, you can try sprinkling a little bit of cornstarch onto their fur. Doing this occasionally is a good way to absorb some of the excess oil without exposing your dog to dangerous chemicals. Be sure not to let them inhale it, though! And never use talcum powder! While dogs make our lives whole, there are plenty of little inconveniences that accompany responsible dog ownership. Baths are simply one of those things! While you may be able to stave off a bath for an extra few weeks by using cornstarch, baby wipes, and an old fashioned damp towel, the truth is that sooner or later your pooch will need to be bathed. Waterless dog shampoos, while they seem like the perfect solution, have the potential to cause more harm than good. Between the aerosol varieties, the scented chemicals, and the unsafe compounds that are commonly found in these dry dog shampoos, you’re better off avoiding them. Getting your pup used to being bathed while they are still a puppy is a great way to make baths less stressful. With a little patience and some practice, you can make the bath experience less of a hassle for both you and your beloved canine companion.